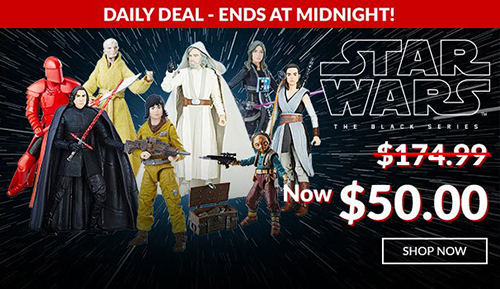 Sponsor Entertainment Earth is having a one-day sale on their cases of 6″ Black Series Wave 14 – for only $50 each – a savings of 71%! Sale ends at midnight tonight (PDT). 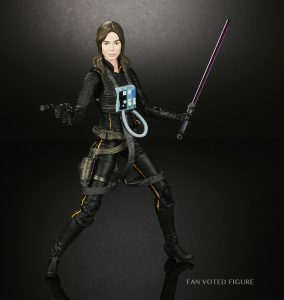 The sought-after 6″ Black Series Jaina Solo is currently available for $19.00 on Amazon.com. Click the image above to use our handy affiliate link. 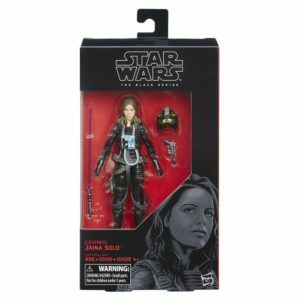 Those on the hunt for the 6″ Black Series Jaina Solo may want to bounce on over to HasbroToyShop as she is currently in stock. 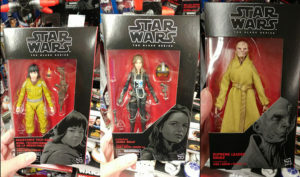 Target.com is now taking orders for the 6″ Black Series Jaina Solo figure. Thanks to Corey from First Order Transmissions for the heads-up. 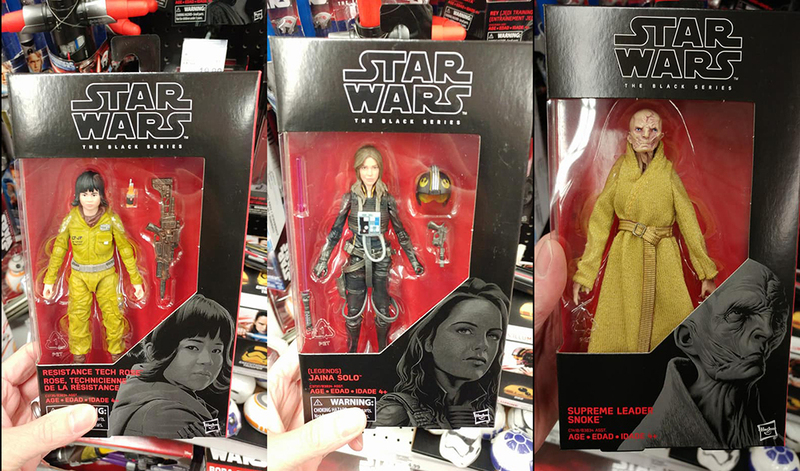 Facebook member Jonathan S. reports finding wave 14 of the 6″ Black Series line (Snoke, Jaina, Rose) at Meijer in West Lafayette, IN. 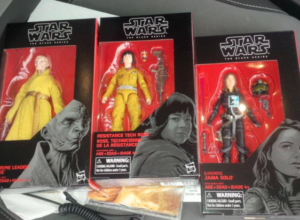 T.J. Babinetz from the Star Wars 6″ Black Series Facebook group also reports finding this wave at Walmart in Mississauga, Canada. Time to step up those toy runs! Civil War was amazing, and we sold out of every single Marvel Legends figure, before the movie was even released. Well the good news is, we have a brand new revision case and sets now available to pre-order. Don’t miss out on some of the figures which others are selling for over $100 each! Those über cool new Funko POP! tees still have many sizes left, but best to reserve one quickly. We also have plenty of new DC, Marvel, Ghostbusters, & more POP! vinyl in stock and up for pre-order. Impressive new Transformers are also in the house and up for pre-order, and definitely hot sellers. Again don’t miss out, just reserve all these today! 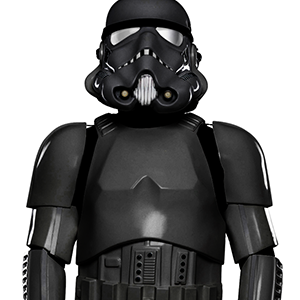 With signature black armor designed to increase sensor-stealth and equipped with light-warping cloaking devices, the Shadow Stormtrooper represents one of the Dark Side’s most lethal soldiers operating under Imperial Intelligence Agent Blackhole. ANOVOS is proud to present this first offering from the STAR WARS® Legends banner. This piece can now be yours: either as a completed uniform with minimal adjustment work required, or as a kit that you can custom build for yourself. Today, Marvel has announced the Star Wars Legends Epic Collection: The Empire Vol. 1 – a gathering of EU/Legends tales focusing on the years following Revenge of the Sith. Visit StarWars.com for a breakdown of included titles.